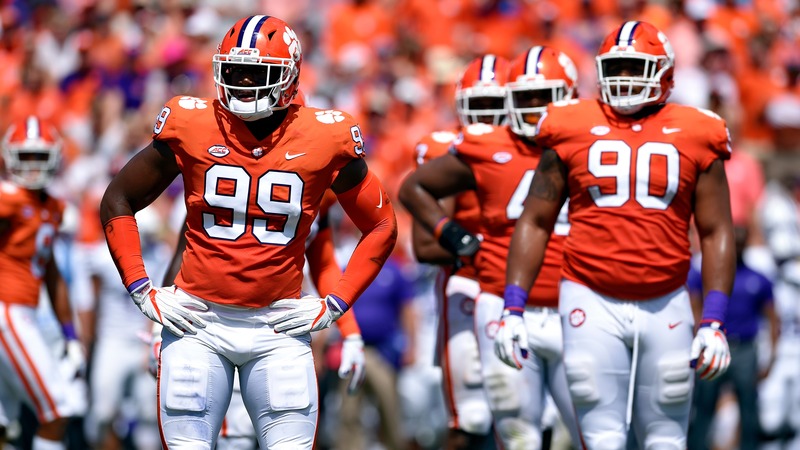 Sharp bettors are laying the points with Clemson in Saturday's Cotton Bowl against Notre Dame and the possible suspension of three Tigers players isn't going to change their minds. Sharp bettors are laying the points with Clemson in Saturday's Cotton Bowl against Notre Dame and the possible suspension of three Tigers players isn't going to change their minds. Clemson star defensive tackle Dexter Lawrence was among three players suspended earlier this week after testing positive for banned substance osterine. Two backups — offensive lineman Zach Giella and tight end Braden Galloway — also failed tests. [Yahoo Sports](https://sports.yahoo.com/will-clemsons-dexter-lawrence-play-cotton-bowl-failed-drug-test-chances-slim-none-212902269.html) reported the players’ chances of playing in the CFP semifinal are "slim and none" even though "B" samples could clear their names. __$5,000 up for grabs:__ [Free-to-enter five-day pick 'em contest](https://betchicago.chalkline.com/games/five-days-of-football-for-5k) Clemson opened as an 11.5-point favorite at the Westgate LV SuperBook before sharp groups bet the Tigers on two separate occasions, pushing the line up to 13.5 by Dec. 15. Pros and Joes are still split on the game, Westgate LV SuperBook oddsmaker Ed Salmons told BetChicago on Thursday. "We haven't seen anything that has changed and this news (of possible suspensions) is nearly a week old," Salmons said. Senior Albert Huggins and sophomore Nyles Pinckney, who each recorded 24 total tackles, are likely to fill Lawrence's void on a defensive line that ranks first nationally in Havoc Rate. Notre Dame will likely have issues regardless of who is playing DT since the Irish rank 116th and 118th in opportunity rate and stuff, respectively. It's going to be tough sledding for RB Dexter Williams an Co. on the ground, likely putting Notre Dame's chances to at least cover on Ian Book's shoulders. The good news is the Tigers defense has been beaten at times through the air this season and rank 33rd in big-play rate allowed -- 33rd is below normal for the Tigers' otherwise elite defense. Book and WRs Miles Boykin and Chase Claypool will need plenty of big plays to keep pace with Clemson QB Trevor Lawrence. The Tigers freshman hasn't shown he's scared of the big lights yet this season, racking up more than 2,600 yards passing, 24 touchdowns and four interceptions. With RB Travis Etienne averaging 8.3 yards per carry this season with 21 touchdowns, Lawrence should have time to make throws on play-action with the Irish ranked just 58th in sack rate. If it sounds like Clemson has the unit advantage in all phases of the game, you're nearly correct. Notre Dame does have a slight S&P+ special teams advantage and a better third-down success rate on offense. __MORE:__ [College Football Playoff odds and props](https://www.betchicago.com/cfp-odds-props-notre-dame-clemson-alabama-oklahoma) # 2018 college football bowl game odds ## Cotton Bowl betting lines, odds and prediction Saturday, Dec. 29 at 3 p.m. CT on ESPN from AT&T Stadium in Arlington, Texas ### Notre Dame vs. Clemson __Point spread:__ Clemson -13 __Total:__ 56.5 __Betting line movement and games notes:__ While sharps are on Clemson, [the public is on Notre Dame](https://www.betchicago.com/college-football-playoff-odds-betting-lines-notre-dame-clemson) and oddsmakers are seeing a big discrepancy with moneyline tickets on the Irish (+350; $100 wins $350 for total payout of $450). The total has increased from 55.5 to 56.5 on Thursday at the Westgate. __S&P+ prediction:__ Clemson 30, Notre Dame 22 __Note:__ S&P+ rankings are an advanced data set of tempo- and opponent-adjusted components of the five factors of college football: Efficiency, explosiveness, field position and finishing drives. Per creator Bill Connelly, a fifth factor, turnovers, is informed marginally by sack rates. __Play and win:__ [Join our free contests](https://betchicago.chalkline.com/) ## Notre Dame betting records, stats 2018 SU record: 12-0 2018 ATS record: 7-4-1 2018 O/U record: 6-6 S&P+ rank: 6 Off. S&P+ rank: 26 Def. S&P+ rank: 4 Special Teams S&P+ rank: 62 ## Clemson betting records, stats 2018 SU record: 13-0 2018 ATS record: 7-6 2018 O/U record: 6-7 S&P+ rank: 2 Off. S&P+ rank: 7 Def. S&P+ rank: 1 Special Teams S&P+ rank: 99 ## Notre Dame vs. Clemson Cotton Bowl betting trends The favorite in Clemson bowl games is 4-12 straight up and 2-14 ATS. Tigers are 7-1 ATS in their last eight bowl games and are 7-2 ATS last nine games away from home. UNDER is 10-1 in Irish's last 11 games as an underdog of 10.5 or greater. Irish are 11-5 ATS in their last 16 games as an underdog.